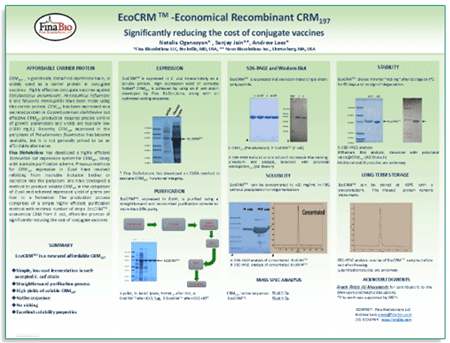 Fina Biosolutions is pleased to offer EcoCRMTM, economical CRM197 from E. coli, to the research and vaccine manufacturing community. CRM197, a genetically detoxified diphtheria toxin, is widely used as a carrier protein in conjugate vaccines. Effective conjugate vaccines against Streptococcus pneumoniae, Haemophilus influenzae band Neisseria meningitidis is have been made using this carrier protein. Fina BioSolutions has developed a highly efficient Escherichia coli expression system for CRM197. We express soluble, properly folded CRM197 in the cytoplasm of E.coli. High expression levels and a simple purification scheme allow us to produce CRM197at low cost and price it accordingly.